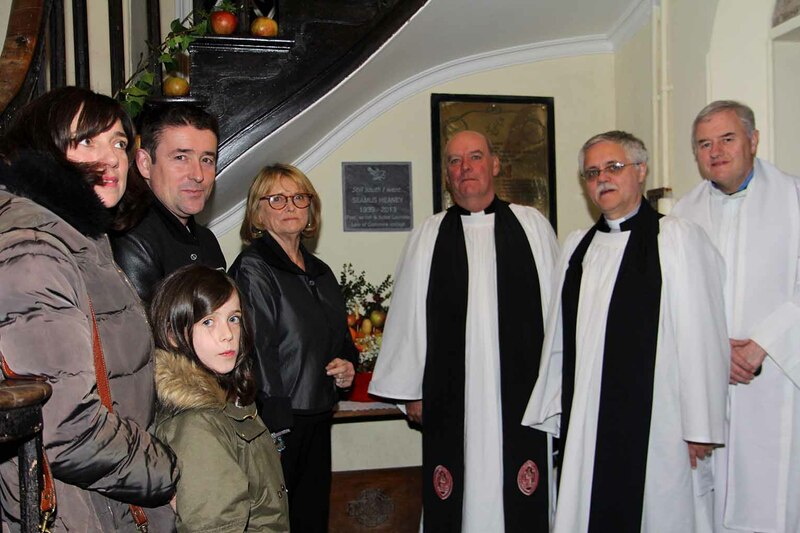 At the dedication of the plaque in memory of Seamus Heaney in Nun’s Cross Church, Killiskey were Jenny McCrohan, Christopher Heaney, Anna Rose, Marie Heaney, Archdeacon Ricky Rountree, the Revd Ken Rue and Fr Eamonn Crosson. 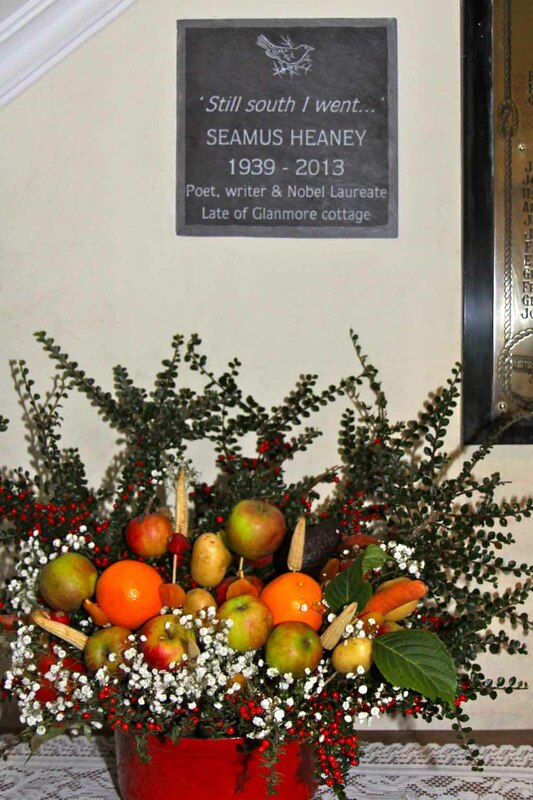 Family and friends of Seamus Heaney gathered in Nun’s Cross Church, Killiskey, last night, Sunday October 13, for the dedication of a plaque in memory of the celebrated poet. The Nobel Laureate was connected to the area through the nearby Glanmore Cottage where he lived with his wife Marie for five years in the 1970s. He maintained a close connection with the area and visited regularly as he sought inspiration for his poetry. He bought the cottage when it went on the market in 1988 and divided his time between Dublin and Wicklow. Last night’s service was attended by Marie Heaney and the couple’s son Christopher along with his wife Jenny McCrohan and their daughter Anna Rose. Welcoming them, the Vicar the Revd Ken Rue noted that the Heaney family had been very generous to the church. The dedication took place after the Wicklow and Killiskey Harvest Thanksgiving Service. The Vicar was joined by the Archdeacon of Glendalough, the Ven Ricky Rountree, who preached and dedicated the plaque and the new Parish Priest of Ashford, the Very Revd Eamonn Crosson, who read the Gospel. A number of Seamus Heaney’s poems were read during the service. Local historian and writer, Sheila Clarke of Ashford Development Association, read Glanmore Sonnets VII while Professor Jim Mays, Emeritus Professor of Modern English and American poetry at University College Dublin, and a Member of the Royal Irish Academy read St Kevin and the Blackbird. During his sermon, Archdeacon Rountree read The Harvest Bow. 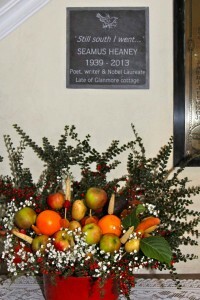 Dedicating the plaque, which is located in the porch of the church, the Archdeacon said the memorial was an acknowledgement of what Seamus Heaney had done for the area. Reading Banks of a Canal, written just days before the poet’s death, he said that like the meandering canal, the soul and life of Seamus Heaney would live on. He added that it was wonderful to have a memorial to him in a place so close to where he wrote so many of his poems.